The MIM-104 Patriot is a surface-to-air missile (SAM) system, the primary of its kind used by the United States Army and several allied nations. It is manufactured by the U.S. defense contractor Raytheon and derives its name from the radar component of the weapon system. The AN/MPQ-53 at the heart of the system is known as the "Phased Array Tracking Radar to Intercept on Target" which is a backronym for PATRIOT. 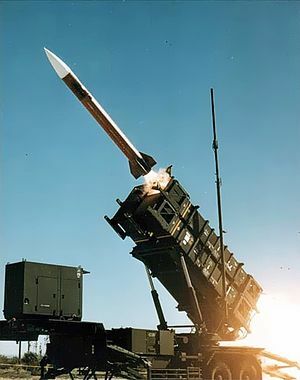 The Patriot System replaced the Nike Hercules system as the U.S. Army's primary High to Medium Air Defense (HIMAD) system, and replaced the MIM-23 Hawk system as the U.S. Army's medium tactical air defense system. In addition to these roles, Patriot has been given the function of the U.S. Army's anti-ballistic missile (ABM) system, which is now Patriot's primary mission. The system is expected to stay fielded until at least 2040. A Patriot system of the German Air Force in August 2005. Since 1981; initial operational capacity 1984. Patriot uses an advanced aerial interceptor missile and high-performance radar systems. Patriot was developed at Redstone Arsenal in Huntsville, Alabama, which had previously developed the Safeguard ABM system and its component Spartan and hypersonic speed Sprint missiles. The symbol for Patriot is a drawing of a Revolutionary War-era Minuteman. Patriot systems have been sold to the Netherlands, Poland, Germany, Japan, Israel, Saudi Arabia, Kuwait, Republic of China (Taiwan), Greece, Spain, United Arab Emirates, Qatar and Romania. South Korea purchased several second-hand Patriot systems from Germany after North Korea test-launched ballistic missiles to the Sea of Japan and proceeded with underground nuclear testing in 2006. Jordan also purchased several second-hand Patriot systems from Germany. Poland hosts training rotations of a battery of U.S. Patriot launchers. This started in the town of Morąg in May 2010 but was later moved further from the Russian border to Toruń and Ustka due to Russian objections. On December 4, 2012, NATO authorized the deployment of Patriot missile launchers in Turkey to protect the country from missiles fired in the civil war in neighboring Syria. Patriot was one of the first tactical systems in the U.S. Department of Defense’s (DoD) to employ lethal autonomy in combat. The Patriot system gained notoriety during the Persian Gulf War of 1991 with the claimed engagement of over 40 Iraqi Scud missiles, those claims became a source of controversy. The system was highly successfully used against Iraqi missiles in 2003 Iraq War, and has been also used by Saudi and Emirati forces in the Yemen conflict against Houthi missile attacks. The Patriot system achieved its first undisputed shootdowns of enemy aircraft in the service of the Israeli Air Defense Command. Israeli MIM-104D batteries shot down two Hamas UAVs during Operation Protective Edge in 2014 and later, on September 23, 2014, an Israeli Patriot battery shot down a Syrian Air Force Sukhoi Su-24 which had penetrated Israeli airspace, achieving the first shootdown of a manned enemy aircraft in the world for the system. In 2003, the Iraq invasion was in its initial stages. During this time, the U.S. Army's Patriot Air Defense System was involved in two major fratricide incidents that cost the lives of three flight crew members. The first was a British GR-4 Tornado that was misclassified as an anti-radiation missile and subsequently engaged. The second accident involved a Navy F/A-18 Hornet fighter jet that was misclassified as a tactical ballistic missile (TBM) and engaged. The cause of these incidents was a combination of human and machine failures. Dr. John Hawley, an engineering psychologist with the U.S. Army Research Laboratory Humans Research and Engineering Directorate utilized his research and experience of Patriot operations leading into the Army's internal efforts to improve this system. Prior to the Patriot, Raytheon was involved in a number of surface to air missile programs, including FABMDS (Field Army Ballistic Missile Defense System), AADS-70 (Army Air-Defense System – 1970) and SAM-D (Surface-to-Air Missile – Development). In 1975, the SAM-D missile successfully engaged a drone at the White Sands Missile Range. During 1976, it was renamed the PATRIOT Air Defense Missile System. The MIM-104 Patriot would combine several new technologies, including the MPQ-53 passive electronically scanned array radar and track-via-missile guidance. Full-scale development of the system began in 1976 and it was deployed in 1984. Patriot was used initially as an anti-aircraft system, but during 1988, it was upgraded to provide limited capability against tactical ballistic missiles (TBM) as PAC-1 (Patriot Advanced Capability-1). The most recent upgrade, called PAC-3, is a nearly total system redesign, intended from the outset to engage and destroy tactical ballistic missiles. The Patriot system has four major operational functions: communications, command and control, radar surveillance, and missile guidance. The four functions combine to provide a coordinated, secure, integrated, mobile air defense system. The Patriot system is modular and highly mobile. A battery-sized element can be installed in less than an hour. All components, consisting of the fire control section (radar set, engagement control station, antenna mast group, electric power plant) and launchers, are a truck- or trailer-mounted. The radar set and launchers (with missiles) are mounted on M860 semi-trailers, which are towed by Oshkosh M983 HEMTTs. Missile reloading is accomplished using a M985 HEMTT truck with a Hiab crane on the back. This crane is larger than the standard Grove cranes found on regular M977 HEMTT and M985 HEMTT cargo body trucks. The truck/crane, called a Guided Missile Transporter (GMT), removes spent missile canisters from the launcher and then replaces them with fresh missiles. Because the crane nearly doubles the height of the HEMTT when not stowed, crews informally refer to it as the "scorpion tail." A standard M977 HEMTT with a regular-sized crane is sometimes referred to as the Large Repair Parts Transporter (LRPT). 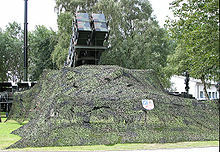 German Patriot system with camouflage. The heart of the Patriot battery is the fire control section, consisting of the AN/MPQ-53 or −65 Radar Set, the AN/MSQ-104 Engagement Control Station (ECS), the OE-349 Antenna Mast Group (AMG), and the EPP-III Electric Power Plant. The system's missiles are transported on and launched from the M901 Launching Station, which can carry up to four PAC-2 missiles or up to sixteen PAC-3 missiles. A Patriot battalion is also equipped with the Information Coordination Central (ICC), a command station designed to coordinate the launches of a battalion and uplink Patriot to the JTIDS or MIDS network. The AN/MPQ-53/65 Radar Set is a passive electronically scanned array radar equipped with IFF, electronic counter-countermeasure (ECCM), and track-via-missile (TVM) guidance subsystems. The AN/MPQ-53 Radar Set supports PAC-2 units, while the AN/MPQ-65 Radar Set supports PAC-2 and PAC-3 units. The main difference between these two radars is the addition of a second traveling wave tube (TWT), which gives the −65 radar increased search, detection, and tracking capability. The radar antenna array consists of over 5,000 elements that "deflect" the radar beam many times per second. The radar antenna array also contains an IFF interrogator subsystem, a TVM array, and at least one "sidelobe canceller" (SLC), which is a small array designed to decrease interference that might affect the radar. Patriot's radar is somewhat unusual in that it is a "detection-to-kill" system, meaning that a single unit performs all search, identification, track, and engagement functions. This is in contrast to most SAM systems, where several different radars are necessary to perform all functions necessary to detect and engage targets. The beam created by the Patriot's flat phased array radar is comparatively narrow and highly agile compared to that of a moving dish. This characteristic gives the radar the ability to detect small, fast targets like ballistic missiles, or low radar cross section targets such as stealth aircraft or cruise missiles. The power and agility of Patriot's radar is also highly resistant to countermeasures, including ECM, radar jamming and use of RWR equipment. Patriot is capable of quickly changing frequencies to resist jamming. AN/MSQ-104 vehicle of a Dutch Patriot unit. The AN/MSQ-104 Engagement Control Station (ECS) is the nerve center of the Patriot firing battery, costing approximately US$6 million per unit. The ECS consists of a shelter mounted on the bed of an M927 5-Ton Cargo Truck or on the bed of a Light Medium Tactical Vehicle (LMTV) cargo truck. The main sub-components of the ECS are the Weapons Control Computer (WCC), the Data Link Terminal (DLT), the UHF communications array, the Routing Logic Radio Interface Unit (RLRIU), and the two-man stations that serve as the system's man-to-machine interface. The ECS is air conditioned, pressurized (to resist chemical/biological attack), and shielded against electromagnetic pulse (EMP) or other such electromagnetic interference. The ECS also contains several SINCGARS radios to facilitate voice communications. The WCC is the main computer within the Patriot system. It is a 24-bit parallel militarized computer with fixed and floating point capability. It is organized in a multiprocessor configuration that operates at a maximum clock rate of 6 megahertz. This computer controls the operator interface, calculates missile intercept algorithms, and provides limited fault diagnostics. Compared to modern personal computers, it has somewhat limited processing power, although it has been upgraded several times during Patriot's service life. The DLT connects the ECS to Patriot's Launching Stations. It uses either a SINCGARS radio or fiber optic cables to transmit encrypted data between the ECS and the launchers. Through the DLT, the system operators can remotely emplace, slew or stow launchers, perform diagnostics on launchers or missiles, and fire missiles. The UHF communications array consists of three UHF radio "stacks" and their associated patching and encrypting equipment. These radios are connected to the antennas of the OE-349 Antenna Mast Group, which are used to create UHF "shots" between sister Patriot batteries and their associated ICC. This creates a secure, real-time data network (known as PADIL, Patriot Data Information Link) that allows the ICC to centralize control of its subordinate firing batteries. The RLRIU functions as the primary router for all data coming into the ECS. The RLRIU gives a firing battery an address on the battalion data network, and sends/receives data from across the battalion. It also "translates" data coming from the WCC to the DLT, facilitating communication with the launchers. Patriot's crew stations are referred to as Manstation 1 and 3 (MS1 and MS3). These are the stations where Patriot operators interface with the system. The manstations consist of a monochrome (green and black) screen surrounded by various Switch Indicators. Each manstation also has a traditional QWERTY keyboard and isometric stick, a tiny joystick that functions much like a PC mouse. It is through these switch indicators and the Patriot user interface software that the system is operated. The Army is planning upgrades to the Patriot system's radar components, including a new digital processor that replaces the one used since the system's introduction. In 2017, the Patriot will get a new active electronically scanned array (AESA) radar that has greater range and sharper discrimination. The main Gallium Nitride (GaN)-based AESA array measures 9 ft × 13 ft (2.7 m × 4.0 m), is a bolt-on replacement antenna for the current antenna, and is oriented toward the primary threat; new rear panel arrays are a quarter the size of the main array and let the system look behind and to the sides, providing 360-degree coverage. The GaN AESA radar also has 50 percent less maintenance costs. Instead of shining a single transmitter through many lenses, the GaN array uses many smaller transmitters, each with its own control, increasing flexibility and allowing it to work even if some transmitters do not. The OE-349 Antenna Mast Group (AMG) is mounted on an M927 5-Ton Cargo Truck. It includes four 4 kW antennas in two pairs on remotely controlled masts. Emplacement of the AMG can have no greater than a 0.5-degree roll and a 10-degree crossroll. The antennas can be controlled in azimuth, and the masts can be elevated up to 100 feet 11 inches (30.76 m) above ground level. 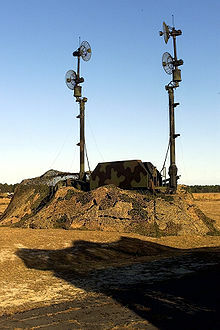 Mounted at the base of each pair of antennas are two high-power amplifiers associated with the antennas and the radios in the collocated shelter. It is through these antennas that the ECS and ICC send their respective UHF "shots" to create the PADIL network. The polarity of each shot can be changed by adjusting the "feedhorn" to a vertical or horizontal position. This enables a greater chance of communication shots reaching their intended target when terrain obstacles may otherwise obscure the signal. The EPP-III Diesel-Electric Power Plant (EPP) is the power source for the ECS and Radar. The EPP consists of two 150 kilowatt diesel engines with 400 hertz, 3-phase generators that are interconnected through the power distribution unit. The generators are mounted on a modified M977 HEMTT. Each EPP has two 100-gallon fuel tanks and a fuel distribution assembly with grounding equipment. Each diesel engine can operate for more than eight hours with a full fuel tank. The EPP delivers its power to the Radar and ECS through cables stored in reels alongside the generators. Additionally, it powers the AMG via a cable routed through the ECS. The M901 Launching Stations are remotely operated, self-contained units. The ECS controls operation of the launchers through each launcher's DLT, via fiber optic or VHF (SINCGARS) data link. Integral levelling equipment permits emplacement on slopes of up to 10 degrees. Each launcher is trainable in azimuth and elevates to a fixed, elevated launch position. Precise aiming of the launcher before launch is not necessary; thus, no extra lags are introduced into system reaction time. Each launcher is also capable of providing detailed diagnostics to the ECS via the data link. The launching station contains four major equipment subsystems: the launcher generator set, the launcher electronics module (LEM), the launcher mechanics assembly (LMA), and the launcher interconnection group (LIG). The generator set consists of a 15 kW, 400 Hz generator that powers the launcher. The LEM is used for the real-time implementation of launcher operations requested via data link from the ECS. The LMA physically erects and rotates the launcher's platform and its missiles. The LIG connects the missiles themselves to the launcher via the Launcher Missile Round Distributor (LMRD). The first fielded variant was the MIM-104A "Standard". It was optimized solely for engagements against aircraft and had very limited capability against ballistic missiles. It had a range of 70 km (43 mi), and a speed in excess of Mach 2. The MIM-104B "anti-standoff jammer" (ASOJ) is a missile designed to seek out and destroy ECM emitters. The MIM-104C PAC-2 missile was the first Patriot missile that was optimized for ballistic missile engagements. The GEM series of missiles (MIM-104D/E) are further refinements of the PAC-2 missile. The PAC-3 missile is a new interceptor, featuring a Ka band active radar seeker, employing "hit-to-kill" interception (in contrast to previous interceptors' method of exploding in the vicinity of the target, destroying it with shrapnel), and several other enhancements which dramatically increase its lethality against ballistic missiles. The specific information for these different kinds of missiles are discussed in the "Variants" section. The first seven of these are in the larger PAC-2 configuration of a single missile per canister, of which four can be placed on a launcher. PAC-3 missile canisters contain four missiles, so that sixteen rounds can be placed on a launcher. The missile canister serves as both the shipping and storage container and the launch tube. Patriot missiles are referred to as "certified rounds" as they leave the factory, and additional maintenance is not necessary on the missile prior to it being launched. The PAC-2 missile is 5.8 metres (19 ft 0 in) long, weighs about 900 kilograms (2,000 lb), and is propelled by a solid-fueled rocket motor. The PAC-2 family of missiles all have a fairly standard design, the only differences between the variants being certain internal components. They consist of (from front to rear) the radome, guidance section, warhead section, propulsion section, and control actuator section. The radome is made of slip-cast fused silica approximately 16.5 millimetres (0.65 in) thick, with nickel alloy tip, and a composite base attachment ring bonded to the slip cast fused silica and protected by a molded silicone rubber ring. The radome provides an aerodynamic shape for the missile and microwave window and thermal protection for the RF seeker and electronic components. The Patriot guidance section consists primarily of the modular digital airborne guidance system (MDAGS). The MDAGS consists of a modular midcourse package that performs all of the required guidance functions from launch through midcourse and a terminal guidance section. The TVM seeker is mounted on the guidance section, extending into the radome. The seeker consists of an antenna mounted on an inertial platform, antenna control electronics, a receiver, and a transmitter. The Modular Midcourse Package (MMP), which is located in the forward portion of the warhead section, consists of the navigational electronics and a missile-borne computer that computes the guidance and autopilot algorithms and provides steering commands according to a resident computer program. The warhead section, just aft of the guidance section, contains the proximity fused warhead, safety-and-arming device, fuzing circuits and antennas, link antenna switching circuits, auxiliary electronics, inertial sensor assembly, and signal data converter. The propulsion section consists of the rocket motor, external heat shield, and two external conduits. The rocket motor includes the case, nozzle assembly, propellant, liner and insulation, pyrogen igniter, and propulsion arming and firing unit. The casing of the motor is an integral structural element of the missile airframe. It contains a conventional, casebonded solid rocket propellant. The Control Actuator Section (CAS) is at the aft end of the missile. It receives commands from the missile autopilot and positions the fins. The missile fins steer and stabilize the missile in flight. A fin servo system positions the fins. The fin servo system consists of hydraulic actuators and valves and an electrohydraulic power supply. The electrohydraulic power consists of a battery, motor pump, oil reservoir, gas pressure bottle, and accumulator. Patriot was first introduced with a single missile type: the MIM-104A. This was the initial "Standard" missile (still known as "Standard" today). In Patriot's early days, the system was used exclusively as an anti-aircraft weapon, with no capability against ballistic missiles. This was remedied during the late 1980s when Patriot received its first major system overhaul with the introduction of the Patriot Advanced Capability missile and concurrent system upgrades. Patriot Advanced Capability (PAC-1), known today as the PAC-1 upgrade, was a software-only upgrade. The most significant aspects of this upgrade were changing the way the radar searched and the way the system defended its assets. Instead of searching low to the horizon, the top of the radar's search angle was lifted to near vertical (89 degrees) from the previous angle of 25 degrees. This was done as a counter to the steep parabolic trajectory of inbound ballistic missiles. The search beams of the radar were tightened, and while in "TBM search mode" the "flash", or the speed at which these beams were shot out, was increased significantly. While this increased the radar's detection capability against the ballistic missile threat set, it decreased the system's effectiveness against traditional atmospheric targets, as it reduced the detection range of the radar as well as the number of "flashes" at the horizon. Because of this, it was necessary to retain the search functions for traditional atmospheric threats in a separate search program, which could be easily toggled by the operator based on the expected threat. Additionally, the ballistic missile defense capability changed the way Patriot defended targets. Instead of being used as a system to defend a significant area against enemy air attack, it was now used to defend much smaller "point" targets, which needed to lie within the system's TBM "footprint". The footprint is the area on the ground that Patriot can defend against inbound ballistic missiles. During the 1980s, Patriot was upgraded in relatively minor ways, mostly to its software. Most significant of these was a special upgrade to discriminate and intercept artillery rockets in the vein of the Multiple rocket launcher, which was seen as a significant threat from North Korea. This feature has not been used in combat and has since been deleted from U.S. Army Patriot systems, though it remains in South Korean systems. Another upgrade the system saw was the introduction of another missile type, designated MIM-104B and called "anti stand-off jammer" (ASOJ) by the Army. This variant is designed to help Patriot engage and destroy ECM aircraft at standoff ranges. It works similar to an anti-radiation missile in that it flies a highly lofted trajectory and then locates, homes in on, and destroys the most significant emitter in an area designated by the operator. During the late 1980s, tests began to indicate that, although Patriot was certainly capable of intercepting inbound ballistic missiles, it was questionable whether or not the MIM-104A/B missile was capable of destroying them reliably. This necessitated the introduction of the PAC-2 missile and system upgrade. For the system, the PAC-2 upgrade was similar to the PAC-1 upgrade. Radar search algorithms were further optimized, and the beam protocol while in "TBM search" was further modified. PAC-2 also saw Patriot's first major missile upgrade, with the introduction of the MIM-104C, or PAC-2 missile. This missile was optimized for ballistic missile engagements. Major changes to the PAC-2 missile were the size of the projectiles in its blast-fragmentation warhead (changed from around 2 grams to around 45 grams), and the timing of the pulse-Doppler radar fuse, which was optimized for high-speed engagements (though it retained its old algorithm for aircraft engagements if necessary). Engagement procedures were also optimized, changing the method of fire the system used to engage ballistic missiles. Instead of launching two missiles in an almost simultaneous salvo, a brief delay (between 3 and 4 seconds) was added in order to allow the second missile launched to discriminate a ballistic missile warhead in the aftermath of the explosion of the first. PAC-2 was first tested in 1987 and reached Army units in 1990, just in time for deployment to the Middle East for the Persian Gulf War. It was there that Patriot was first regarded as a successful ABM system and proof that ballistic missile defense was indeed possible. The complete study on its effectiveness remains classified. There were many more upgrades to PAC-2 systems throughout the 1990s and into the 21st century, again mostly centering on software. However, the PAC-2 missiles were modified significantly—four separate variants became known collectively as guidance enhanced missiles (GEM). The main upgrade to the original GEM missile was a new, faster proximity fused warhead. Tests had indicated that the fuse on the original PAC-2 missiles were detonating their warheads too late when engaging ballistic missiles with an extremely steep ingress, and as such it was necessary to shorten this fuse delay. The GEM missile was also given a new "low noise" seeker head designed to reduce interference in front of the missile's radar seeker, and a higher performance seeker designed to better detect low radar cross-section targets. The GEM was used extensively in Operation Iraqi Freedom (OIF), during which air defense was highly successful. Just prior to OIF, it was decided to further upgrade the GEM and PAC-2 missiles. This upgrade program produced missiles known as the GEM/T and the GEM/C, the "T" designator referring to "TBM", and the "C" designator referring to cruise missiles. These missiles were both given a totally new nose section, which was designed specifically to be more effective against low altitude, low RCS targets like cruise missiles. Additionally, the GEM/T was given a new fuse which was further optimized against ballistic missiles. The GEM/C is the upgraded version of the GEM, and the GEM/T is the upgraded version of the PAC-2. The GEM+ entered service in 2002, and the US Army is currently upgrading its PAC-2 and GEM missiles to the GEM/C or GEM/T standard. PAC-3 missile launcher, note four missiles in each canister. The PAC-3 upgrade is a significant upgrade to nearly every aspect of the system. It took place in three stages deployed in 1995, 1996 and 2000, and units were designated Configuration 1, 2, or 3. The system itself saw another upgrade of its WCC and its software, and the communication setup was given a complete overhaul. Due to this upgrade, PAC-3 operators can now see, transmit, and receive tracks on the Link 16 Command and Control (C2) network using a Class 2M Terminal or MIDS LVT Radio. This capability greatly increases the situational awareness of Patriot crews and other participants on the Link 16 network than are able to receive the Patriot local air picture. The software can now conduct a tailored TBM search, optimizing radar resources for search in a particular sector known to have ballistic missile activity, and can also support a "keepout altitude" to ensure ballistic missiles with chemical warheads or early release submunitions (ERS) are destroyed at a certain altitude. For Configuration 3 units, the Patriot radar was completely redesigned, adding another travelling wave tube (TWT) that increased the radar's search, detection, tracking, and discrimination abilities. The PAC-3 radar is capable, among other things, of discriminating whether or not an aircraft is manned and which of multiple reentering ballistic objects are carrying ordnance. The PAC-3 upgrade carried with it a new missile design, nominally known as MIM-104F and called PAC-3 by the Army. The PAC-3 missile evolved from the Strategic Defense Initiative's ERINT missile, and so it is dedicated almost entirely to the anti-ballistic missile mission. Due to miniaturization, a single canister can hold four PAC-3 missiles (as opposed to one PAC-2 missile per canister). The PAC-3 missile is also more maneuverable than previous variants, due to 180 tiny pulse solid propellant rocket motors mounted in the forebody of the missile (called Attitude Control Motors, or ACMs) which serve to fine align the missile trajectory with its target to achieve hit-to-kill capability. However, the most significant upgrade to the PAC-3 missile is the addition of a Ka band active radar seeker. This allows the missile to drop its uplink to the system and acquire its target itself in the terminal phase of its intercept, which improves the reaction time of the missile against a fast-moving ballistic missile target. The PAC-3 missile is accurate enough to select, target, and home in on the warhead portion of an inbound ballistic missile. The active radar also gives the warhead a "hit-to-kill" (kinetic kill vehicle) capability that completely eliminates the need for a traditional proximity-fused warhead. However, the missile still has a small explosive warhead, called Lethality Enhancer, a warhead which launches 24 low-speed tungsten fragments in radial direction to make the missile cross-section greater and enhance the kill probability. This greatly increases the lethality against ballistic missiles of all types. The PAC-3 upgrade has effectively quintupled the "footprint" that a Patriot unit can defend against ballistic missiles of all types, and has considerably increased the system's lethality and effectiveness against ballistic missiles. It has also increased the scope of ballistic missiles that Patriot can engage, which now includes several intermediate range. However, despite its increases in ballistic missile defense capabilities, the PAC-3 missile is a less capable interceptor of atmospheric aircraft and air-to-surface missiles. It is slower, has a shorter range, and has a smaller explosive warhead compared to older Patriot missiles. Patriot's PAC-3 interceptor is the primary interceptor for the new MEADS system, which was scheduled to enter service alongside Patriot in 2014. On November 29, 2012, the MEADS detected, tracked, intercepted and destroyed an air-breathing target in its first-ever intercept flight test at White Sands Missile Range, New Mexico. Lockheed Martin Missiles and Fire Control is the prime contractor on the PAC-3 Missile Segment upgrade to the Patriot air defense system which will make the missile more agile and extend its range by up to 50%. The PAC-3 Missile Segment upgrade consists of the PAC-3 missile, a very agile hit-to-kill interceptor, the PAC-3 missile canisters (in four packs), a fire solution computer, and an Enhanced Launcher Electronics System (ELES). The PAC-3 Missile Segment Enhancement (MSE) interceptor increases altitude and range through a more powerful dual-pulse motor for added thrust, larger fins that collapse inside current launchers, and other structural modifications for more agility. The U.S. Army accepted the first PAC-3 MSE interceptors on October 6, 2015, and Initial Operational Capability (IOC) was declared in August 2016. The PAC-3 MSE is capable of intercepting longer-range theater ballistic missiles. In August 2013, Raytheon and Rafael Advanced Defense Systems began to seek funding for a fourth-generation Patriot intercepting system, called the Patriot Advanced Affordable Capability-4 (PAAC-4). The system aims to integrate the Stunner interceptor from the jointly-funded David's Sling program with Patriot PAC-3 radars, launchers, and engagement control stations. The two-stage, multimode seeking Stunner would replace single-stage, radar-guided PAC-3 missiles produced by Lockheed Martin. Government and industry sources claim the Stunner-based PAAC-4 interceptors will offer improved operational performance at 20 percent of the $2 million unit cost of the Lockheed-built PAC-3 missiles. The companies are seeking $20 million in U.S. government funding to demonstrate cost and performance claims through a prototype PAAC-4 system. Israeli program officials have said that a previous teaming agreement between Raytheon and Rafael would allow the U.S. company to assume prime contractor status, and produce at least 60 percent of the Stunner missile in the United States. The Missile Defense Agency has said that the U.S. Army is considering use of the Stunner as a potential solution to future U.S. military requirements. Patriot upgrades continue, with the most recent being new software known as PDB-7.x (PDB standing for "Post Deployment Build"). This software will allow Configuration 3 units to discriminate targets of all types, to include anti-radiation missile carriers, helicopters, unmanned aerial vehicles, and cruise missiles. The PAC-3 missile is currently being upgraded through the Missile Segment Enhancement (MSE). The MSE upgrade includes a new fin design and a more powerful rocket engine. Lockheed Martin has proposed an air-launched variant of the PAC-3 missile for use on the F-15C Eagle. Other aircraft, such as the F-22 Raptor and the P-8A Poseidon, have also been proposed. In the long term, it is expected that existing Patriot batteries will be gradually upgraded with MEADS technology. Because of economic conditions, the U.S. chose to upgrade its Patriot missiles instead of buying the MEADS system. The Royal Netherlands Air Force decided to upgrade its existing systems to the latest standard extending operational use until 2040. Raytheon has developed the Patriot guidance enhanced missile (GEM-T), an upgrade to the PAC-2 missile. The upgrade involves a new fuse and the insertion of a new low noise oscillator which increases the seeker's sensitivity to low radar cross-section targets. In April 2013, Raytheon received U.S. Army approval for a second recertification, extending the operational life of the worldwide inventory of Patriot missiles from 30 to 45 years. Raytheon Company is enhancing the Patriot Integrated Air and Missile Defense (IAMD) System under a $235 million modernization task order from the United States Army. Announced by The Department of Defense (DoD) on January 30, 2018 the system upgrades will be funded by the 14 nations that rely on Patriot for integrated air and missile defense. This is the first of five annual, indefinite delivery/indefinite quantity task order awards with a total contract ceiling of more than $2.3 billion. 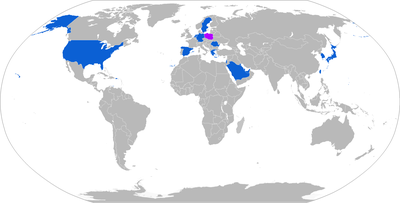 The 14 Patriot Nations are United States of America (USA), The Netherlands, Germany, Japan, Israel, Kingdom of Saudi Arabia, Kuwait, Taiwan, Greece, Spain, Republic of Korea (ROK, South Korea), United Arab Emirates (UAE), Qatar and Romania. In the U.S. Army, the Patriot System is designed around the battalion echelon. A Patriot battalion consists of a headquarters battery (which includes the Patriot ICC and its operators), a maintenance company, and between four and six "line batteries", which are the actual launching batteries that employ the Patriot systems. Each line battery consists of (nominally) six launchers and three or four platoons: Fire Control platoon, Launcher platoon, and Headquarters/Maintenance platoon (either a single platoon or separated into two separate units, at the battery commander's discretion). The Fire Control platoon is responsible for operating and maintaining the "big 4". Launcher platoon operates and maintains the launchers, and Headquarters/Maintenance platoon(s) provides the battery with maintenance support and a headquarters section. The Patriot line battery is commanded by a captain and usually consists of between 70 and 90 soldiers. The Patriot battalion is commanded by a lieutenant colonel and can include as many as 600 soldiers. Once deployed, the system requires a crew of only three individuals to operate. The Tactical Control Officer (TCO), usually a lieutenant, is responsible for the operation of the system. The TCO is assisted by the Tactical Control Assistant (TCA). Communications are handled by the third crewmember, the communications system specialist. A "hot-crew" composed of an NCOIC (usually a Sergeant) and one or more additional launcher crew members is on-hand to repair or refuel launching stations, and a reload crew is on standby to replace spent canisters after missiles are launched. The ICC crew is similar to the ECS crew at the battery level, except its operators are designated as the Tactical Director (TD) and the Tactical Director Assistant (TDA). Patriot battalions prefer to operate in a centralized fashion, with the ICC controlling the launches of all of its subordinate launching batteries through the secure UHF PADIL communications network. U.S. Soldiers familiarize members of the Polish military with preventive maintenance for Patriot missile systems in Morąg, Poland (June 1, 2010). The dismounted Patriot ICC (D-PICC) is a set of equipment which is composed of the same hardware as that at battalion level, but which distributes command and control over the launching batteries, which allows the batteries to disperse over a wider geographic area, with no loss of command and control. D-PICC is deploying to Pacific Command first. A hostile aircraft is detected by the AN/MPQ-65 Radar. The radar examines the track's size, speed, altitude, and heading, and decides whether or not it is a legitimate track or "clutter" created by RF interference. If the track is classified by the radar as an aircraft, in the AN/MSQ-104 Engagement Control Station, an unidentified track appears on the screen of the Patriot operators. The operators examine the speed, altitude and heading of the track. Additionally, the IFF subsystem "pings" the track to determine if it has any IFF response. Based on many factors, including the track's speed, altitude, heading, IFF response, or its presence in "safe passage corridors" or "missile engagement zones", the ECS operator, the TCO (tactical control officer), makes an ID recommendation to the ICC operator, the TD (tactical director). The TD examines the track and decides to certify that it is hostile. Typically, the engagement authority for Patriot units rests with the Regional or Sector Air Defense Commander (RADC/SADC), who will be located either on a U.S. Navy guided missile cruiser or on a USAF AWACS aircraft. A Patriot operator (called the "ADAFCO" or Air Defense Artillery Fire Control Officer) is colocated with the RADC/SADC to facilitate communication to the Patriot battalions. The TD contacts the ADAFCO and correlates the track, ensuring that it is not a friendly aircraft. The ADAFCO obtains the engagement command from RADC/SADC, and delegates the engagement back down to the Patriot battalion. Once the engagement command is received, the TD selects a firing battery to take the shot and orders them to engage. The TCO instructs the TCA to engage the track. The TCA brings the system's launchers from "standby" into "operate". The TCA presses the "engage" switch indicator. This sends a signal to the selected launcher and fires a missile selected automatically by the system. The AN/MPQ-65 Radar, which has been continuously tracking the hostile aircraft, "acquires" the just-fired missile and begins feeding it interception data. The Radar also "illuminates" the target for the missile's semi-active radar seeker. The monopulse receiver in the missile's nose receives the reflection of illumination energy from the target. The track-via-missile uplink sends this data through an antenna in the missile's tail back to the AN/MPQ-65 set. In the ECS, computers calculate the maneuvers that the missile should perform in order to maintain a trajectory to the target and the TVM uplink sends these to the missile. Once in the vicinity of the target, the missile detonates its proximity fused warhead. A missile is detected by the AN/MPQ-65 radar. The radar reviews the speed, altitude, behavior, and radar cross section of the target. If this data lines up with the discrimination parameters set into the system, the missile is presented on the screen of the operator as a ballistic missile target. In the AN/MSQ-104 Engagement Control Station, the TCO reviews the speed, altitude, and trajectory of the track and then authorizes engagement. Upon authorizing engagement, the TCO instructs his TCA to bring the system's launchers into "operate" mode from "standby" mode. The engagement will take place automatically at the moment the computer defines the parameters that ensure the highest probability of kill. The system computer determines which of the battery's launchers have the highest probability of kill and selects them to fire. Two missiles are launched 4.2 seconds apart in a "ripple". The AN/MPQ-65 radar continues tracking the target and uploads intercept information to the PAC-3 missiles which are now outbound to intercept. Upon reaching its terminal homing phase, the Ka band active radar seeker in the nose of the PAC-3 missile acquires the inbound ballistic missile. This radar selects the radar return most likely to be the warhead of the incoming missile and directs the interceptor towards it. The ACMs (attitude control motors) of the PAC-3 missile fire to precisely align the missile on the interception trajectory. The interceptor flies straight through the warhead of the inbound ballistic missile, detonating it and destroying the missile. The second missile locates any debris which may be a warhead and attacks in a similar manner. The AN/MPQ-53 radar system used by the Patriot for target detection, tracking and missile guidance. Prior to the First Gulf War, ballistic missile defense was an unproven concept in war. During Operation Desert Storm, in addition to its anti-aircraft mission, Patriot was assigned to shoot down incoming Iraqi Scud or Al Hussein short range ballistic missiles launched at Israel and Saudi Arabia. The first combat use of Patriot occurred January 18, 1991 when it engaged what was later found to be a computer glitch. There were actually no Scuds fired at Saudi Arabia on January 18. This incident was widely misreported as the first successful interception of an enemy ballistic missile in history. Throughout the war, Patriot missiles attempted engagement of over 40 hostile ballistic missiles. The success of these engagements, and in particular how many of them were real targets, is still controversial. Postwar video analysis of presumed interceptions by MIT professor Theodore Postol suggests that no Scud was actually hit; this analysis is contested by Peter D. Zimmerman, who claimed that photographs of the fuselage of downed SCUD missiles in Saudi Arabia demonstrated that the SCUD missiles were fired into Saudi Arabia and were riddled with fragments from the lethality enhancer of Patriot Missiles. On February 25, 1991, an Iraqi Scud hit the barracks in Dhahran, Saudi Arabia, killing 28 soldiers from the U.S. Army's 14th Quartermaster Detachment. A government investigation revealed that the failed intercept at Dhahran had been caused by a software error in the system's handling of timestamps. The Patriot missile battery at Dhahran had been in operation for 100 hours, by which time the system's internal clock had drifted by one-third of a second. Due to the missile's speed this was equivalent to a miss distance of 600 meters. The radar system had successfully detected the Scud and predicted where to look for it next. However, the timestamps of the two radar pulses being compared were converted to floating point differently: one correctly, the other introducing an error proportionate to the operation time so far (100 hours) caused by the truncation in a 24-bit fixed-point register. As a result, the difference between the pulses was wrong, so the system looked in the wrong part of the sky and found no target. With no target, the initial detection was assumed to be a spurious track and the missile was removed from the system. No interception was attempted, and the Scud impacted on a makeshift barracks in an Al Khobar warehouse, killing 28 soldiers, the first Americans to be killed from the Scuds that Iraq had launched against Saudi Arabia and Israel. Two weeks earlier, on February 11, 1991, the Israelis had identified the problem and informed the U.S. Army and the PATRIOT Project Office, the software manufacturer. As a stopgap measure, the Israelis had recommended rebooting the system's computers regularly. The manufacturer supplied updated software to the Army on February 26. There had previously been failures in the MIM-104 system at the Joint Defense Facility Nurrungar in Australia, which was charged with processing signals from satellite-based early launch detection systems. On February 15, 1991, President George H. W. Bush traveled to Raytheon's Patriot manufacturing plant in Andover, Massachusetts, during the Gulf War, he declared, the "Patriot is 41 for 42: 42 Scuds engaged, 41 intercepted!" The President's claimed success rate was thus over 97% to that point in the war. On April 7, 1992 Theodore Postol of the Massachusetts Institute of Technology, and Reuven Pedatzur of Tel Aviv University testified before a House Committee stating that, according to their independent analysis of video tapes, the Patriot system had a success rate of below 10%, and perhaps even a zero success rate. Also on April 7, 1992, Charles A. Zraket of Harvard's Kennedy School of Government and Peter D. Zimmerman of the Center for Strategic and International Studies testified about the calculation of success rates and accuracy in Israel and Saudi Arabia and discounted many of the statements and methodologies in Postol's report. In accordance with the standard firing doctrine on average four Patriots were launched at each incoming Scud – in Saudi Arabia an average of three Patriots were fired. The large number of missiles fired suggests low confidence in individual missiles and a higher rate of successful interceptions was achieved through brute force. For example, if a Patriot has a 50% individual success rate, two missiles will intercept 75% of the time, and three will intercept 87.5% of the time. Only one has to hit for a successful interception, but this does not mean that the other missiles would not also have hit. 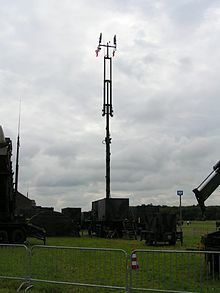 Patriot Antenna Mast Group (AMG), a 4 kW UHF communications array. The Iraqi redesign of the Scuds also played a role. Iraq had redesigned its Scuds by removing weight from the warhead to increase speed and range, but the changes weakened the missile and made it unstable during flight, creating a tendency for the Scud to break up during its descent from near space. This presented a larger number of targets as it was unclear which piece contained the warhead. What all these factors mean, according to Zimmerman, is that the calculation of "Kills" becomes more difficult. Is a kill the hitting of a warhead or the hitting of a missile? If the warhead falls into the desert because a Patriot hit its Scud, is it a success? What if it hits a populated suburb? What if all four of the engaging Patriot missiles hit, but the warhead falls anyway because the Scud broke up? According to the Zraket testimony there was a lack of high quality photographic equipment necessary to record the interceptions of targets. Therefore, Patriot crews recorded each launch on standard definition videotape, which was insufficient for detailed analysis. Damage assessment teams videotaped the Scud debris that was found on the ground, and crater analysis was then used to determine if the warhead was destroyed before the debris crashed or not. Furthermore, part of the reason for the 30% improvement in success rate in Saudi Arabia compared to Israel is that the Patriot merely had to push the incoming Scud missiles away from military targets in the desert or disable the Scud's warhead in order to avoid casualties, while in Israel the Scuds were aimed directly at cities and civilian populations. The Saudi Government also censored any reporting of Scud damage by the Saudi press. The Israeli Government did not institute the same type of censorship. Furthermore, Patriot's success rate in Israel was examined by the IDF (Israel Defense Forces) who did not have a political reason to play up Patriot's success rate. The IDF counted any Scud that exploded on the ground (regardless of whether or not it was diverted) as a failure for the Patriot. Meanwhile, the U.S. Army who had many reasons to support a high success rate for Patriot, examined the performance of Patriot in Saudi Arabia. Both testimonies state that part of the problems stem from its original design as an anti-aircraft system. Patriot was designed with proximity fuzed warheads, which are designed to explode immediately prior to hitting a target spraying shrapnel out in a fan in front of the missile, either destroying or disabling the target. These missiles were fired at the target's center of mass. With aircraft this was fine, but considering the much higher speeds of TBMs, as well as the location of the warhead (usually in the nose), Patriot would most often hit closer to the tail of the Scud due to the delay present in the proximity fuzed warhead, thus not destroying the TBM's warhead and allowing it to fall to earth. In response to the testimonies and other evidence, the staff of the House Government Operations Subcommittee on Legislation and National Security reported, "The Patriot missile system was not the spectacular success in the Persian Gulf War that the American public was led to believe. There is little evidence to prove that the Patriot hit more than a few Scud missiles launched by Iraq during the Gulf War, and there are some doubts about even these engagements. The public and the United States Congress were misled by definitive statements of success issued by administration and Raytheon representatives during and after the war." A Fifth Estate documentary quotes the former Israeli Defense Minister as saying the Israeli government was so dissatisfied with the performance of the missile defense, they were preparing their own military retaliation on Iraq regardless of U.S. objections. That response was canceled only with the ceasefire with Iraq. Patriot was deployed to Iraq a second time in 2003, this time to provide air and missile defense for the forces conducting Operation Iraqi Freedom (OIF). Patriot PAC-3, GEM, and GEM+ missiles both had a very high success rate, intercepting Al-Samoud 2 and Ababil-100 tactical ballistic missiles. However, no longer-range ballistic missiles were fired during that conflict. The systems were stationed in Kuwait and Iraq successfully destroying a number of hostile surface-to-surface missiles using the new PAC-3 and guidance enhanced missiles. Patriot missile batteries were involved in three friendly fire incidents, resulting in the downing of a Royal Air Force Tornado and the death of both crew members, Flight Lieutenant Kevin Barry Main (Pilot) and Flight Lieutenant David Rhys Williams (Navigator/WSO), on March 23, 2003. On March 24, 2003, a USAF F-16CJ Fighting Falcon fired a HARM anti-radiation missile at a Patriot missile battery after the Patriot's radar had locked onto and prepared to fire at the aircraft, causing the pilot to mistake it for an Iraqi surface-to-air missile system. The HARM missed its target and no one was injured; the Patriot Radar was examined and continued to operate but was replaced due to a chance that a fragment might have penetrated it and gone undetected. On April 2, 2003, two PAC-3 missiles shot down a USN F/A-18 Hornet killing U.S. Navy Lieutenant Nathan D. White of VFA-195, Carrier Air Wing Five. Israeli Patriot launcher on display for Yom Ha'atzmaut 2017. The Israeli Air Defense Command operates MIM-104D Patriot (PAC-2/GEM+) batteries with Israeli upgrades. The Israel Defense Forces' designation for the Patriot weapon system is "Yahalom" (Hebrew: יהלום‎, diamond). During Operation Protective Edge, Patriot batteries of the Israeli Air Defense Command intercepted and destroyed two unmanned aerial vehicles launched by Hamas. The interception of a Hamas drone on July 14, 2014, was the first time in the history of the Patriot system's use that it successfully intercepted an enemy aircraft. On August 31, 2014, a Syrian unmanned aerial vehicle was shot down by an Israeli Air Defense Command MIM-104D Patriot missile near Quneitra, after it had penetrated Israeli airspace over the Israeli-occupied Golan Heights. Nearly a month later, on September 23, a Syrian Air Force Sukhoi Su-24 was shot down in similar circumstances. On 17 July 2016 two Israeli Patriot missiles missed an incoming drone launched from Syria. 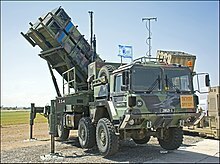 Israeli Air Defence Command fired two Patriot missiles, but did not manage to destroy the target. Russia Today stated that the drone penetrated four kilometers into Israeli airspace, and flew back into Syria. On April 27, 2017, another Syrian UAV was shot down by an Israeli Patriot battery which fired two missiles against the target. On September 19, 2017, a Hezbollah intelligence drone was shot down as it tried infiltrating Israel through the Golan border. On 24 June 2018 a single Israeli Patriot missile was fired toward a drone which was approaching Israel from Syria. The missile missed its target. The drone turned back to Syria. In a similar incident, in the afternoon of 11 July 2018 an Israeli Patriot missile shot down a drone which was approaching Israel from Syria. With a third engagement in few days, in the afternoon of 13 July 2018 an Israeli Patriot missile shot down a drone which was approaching Israel from Syria. On July 24, 2018, an Israeli Patriot shot down a Syrian Sukhoi Su-22 fighter which crossed into Israeli airspace. On June 6, 2015, a Patriot battery was used to shoot down a Scud missile, fired at Saudi Arabia by Houthi rebels in response to the Saudi Arabian-led intervention in Yemen. Another Scud was fired at an electricity station in Jizan province and intercepted by a Saudi Patriot on August 26, 2015. Saudi Arabia claims that another long-range ballistic missile was fired toward Mecca and intercepted by a Saudi Patriot on October 28, 2016. However; Houthi sources say that the missile's intended target was the air force base in King Abdulaziz International Airport in Jeddah, 65 km (40 miles) north-west of Mecca. While the Coalition deploys Patriot systems to counter missile threats, the destruction of the Patriots' radar systems enables Houthi and Saleh-aligned forces to target Coalition assets with volleys of missile-fire unhindered. On March 25, 2018, another missile apparently fired from Yemen was intercepted by a Patriot missile over Riyadh. According to Brigadier General Murad Turaiq, the commander of some of the Yemeni forces allied to the Saudi-led coalition currently fighting in Yemen, Patriot air defence systems deployed to Yemen by the United Arab Emirates (UAE) have successfully intercepted two ballistic missiles fired by Houthi forces. General Turaiq told the Abu Dhabi-based The National newspaper on November 14 that the first missile was shot down late the previous day in the Al-Gofainah area and a second was intercepted before it hit the building hosting the control centre for forces operating in Marib and Al-Baydah provinces. Airbus Defence and Space satellite imagery obtained by IHS Jane's showed two Patriot fire units, each with just two launchers, deployed at the Safir airstrip in Marib province on October 1.
and potential operators in purple. 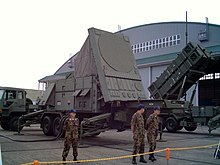 Japan Air Self-Defense Force MIM-104 Patriot launcher. In August 2010, the US Defense Security Cooperation Agency announced that Kuwait had formally requested to buy 209 MIM-104E PAC-2 missiles. In August 2012, Kuwait purchased 60 MIM-104F PAC-3 missiles, along with four radars and 20 launchers. 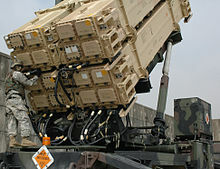 JAF operates three  or four  Patriot missile batteries, acquired from Germany. These batteries are deployed in Irbid near the Syrian border. After the March 2017 Israel–Syria incident, government spokesperson Mohammad Momani threatened to use Patriot missiles to fend off any possible missile attack coming from Syria. The United Arab Emirates closed a deal (nearly $4 billion) with Lockheed Martin, Raytheon and the US Government to buy and operate the latest development of the PAC-3 system, as well as 288 of Lockheed's PAC-3 missiles, and 216 GEM-T missiles. The deal is part of the development of a national defense system to protect the Emirates from air threats. In November 2012 it was announced the export from the United States of 246 MIM-104E GEM-T and 786 PAC-3 missiles and related equipment. Declared operational in November 2018. The US Army operates a total of 1,106 Patriot launchers. In 2010, in the actual service of 483. The government of Romania signed on November 29, 2017, an agreement to purchase seven Patriot Configuration 3+ units, complete with radars, a control station, antennas, launching stations and power plants. Also included are 56 Patriot MIM-104E Guidance Enhanced Missile TBM (GEM-T) missiles and 168 Patriot Advanced Capability — 3 Missile Segment Enhancement missiles. The sale, according to the Defense Security Cooperation Agency notification, could be worth up to $3.9 billion. The Patriot systems will enter the endowment of the Romanian Land Forces and Romanian Air Force in the second half of 2019, with the first system due to become operational at mid-2020. Romania will be the 14th Patriot customer worldwide and the one of the two former Warsaw Pact states to receive one. In November 2017, the U.S. State Department approved a $10.5 billion sale of four Patriot missile defense system to Poland. However, the high cost for the systems has caused some hesitation in Poland. In February 2018, Polish minister of defence Mariusz Błaszczak announced on Twitter that a reduced price was negotiated for the system. On March 28, 2018 the Ministry of National Defence signed the deal worth $4.75 billion for two Patriot Configuration 3+ batteries for deliveries in 2022. The purchase includes Northrop Grumman's IBCS Battle Command System and four fire units equipped with four AN/MPQ-65 radars, 16 launchers, four Engagement Control Stations, six Engagement Operation Centers, 12 IFCN Relays and 208 PAC-3 MSE missiles. In the Phase II Poland plans to order six further batteries equipped with an AESA radar and Raytheon's SkyCeptor interceptors. Sweden has decided to request an offer for the Patriot and on the 10th of August 2018 an agreement was signed for 4 units and 12 launchers to form two batteries. Final cost not public. The predicted budget will be 10 billion SEK. The system has been named "Luftvärnssystem 103" which translates to "Anti Aircraft System 103"
The launcher of Iranian Sayyad-2 missile that consist of four canisters in 2×2 configuration is one of the interesting things about this new surface to air missile because it has so much apparent similarity to American MIM-104 Patriot SAM system launchers. ^ a b Parsch, Andreas. "Raytheon MIM-104 Patriot". Directory of U.S. Military Rockets and Missiles. Retrieved September 27, 2014. ^ Brain, Marshall. "How Patriot Missiles Work". HowStuffWorks. Retrieved September 27, 2014. ^ "South Korea Eyes Independent Missile Defense System". Spacewar.com. December 20, 2006. Retrieved September 27, 2014. ^ "Building the Shield". Defense News. March 21, 2011. Archived from the original on January 21, 2013. Retrieved September 27, 2014. ^ Lekic, Slobodan (December 4, 2012). "NATO backs Patriot anti-missile system for Turkey". Boston.com. Archived from the original on October 20, 2013. Retrieved December 4, 2012. ^ Hawley, John K. (February 8, 2017). "Patriot Wars: Automation and the Patriot Air and Missile Defense System". ^ a b c Raved, Ahiya (September 23, 2014). "IDF: Syrian fighter jet shot down over Golan". Ynetnews. Retrieved September 27, 2014. ^ Savage-Knepshield, Pamela; Martin, John; Lockett III, John; Allender, Laurel (2013). Designing Soldier Systems: Current Issues in Human Factors. Ashgate Publishing, Ltd.
^ Hawley, John (January 25, 2017). "Patriot Wars". CNAS. ^ Delaney, William P. (2015). Perspectives on Defense Systems Analysis. MIT Press. p. 64. ISBN 978-0-262-02935-3. ^ Freedberg Jr., Sydney J. (August 12, 2015). "Army Missile Defense Must Step Up Its Game: Heidi Shyu". Breaking Defense.com. Retrieved January 5, 2018. ^ "Patriot's AESA radar soon to be ready for production". Army Recognition.com. October 14, 2015. Retrieved January 5, 2018. ^ "US Army Budget FY2011" (PDF). Office of the ASA(FM&C). February 2010. Archived from the original (PDF) on February 11, 2017. Retrieved April 6, 2010. ^ a b "Patriot TMD". Global Security.org. Retrieved January 5, 2018. ^ "PATRIOT Advanced Capability-2 (PAC-2)". U.S. Department of Defence/U.S. Missile Defense Agency. Archived from the original on April 23, 2016. Retrieved March 28, 2015. ^ "Patriot PAC-2". Military-Today.com. Retrieved January 5, 2018. ^ Parsch, Andreas. "Lockheed Martin Patriot PAC-3". Directory of U.S. Military Rockets and Missiles. Retrieved September 27, 2014. ^ "Air Defense: Patriot Gains A Longer Reach Against Missiles". Strategy Page.com. June 18, 2013. Retrieved September 27, 2014. ^ "MIM-104A". Encyclopedia Astronautica. Archived from the original on March 3, 2016. Retrieved March 28, 2015. ^ "Patriot Fact Sheet" (PDF). NATO. Retrieved March 28, 2015. ^ "PAC-3 Missile" (PDF). Lockheed Martin. 2010. Archived from the original (PDF) on February 10, 2018. Retrieved January 5, 2018. ^ "32nd AAMDC: Operation Iraqi Freedom" (PDF). OperationTelic.co.uk. September 2003. Retrieved September 27, 2014. 9 of 9 vs TBM with no loss of life or equipment. ^ "PATRIOT MIM-104F Advanced Capability – 3 (PAC-3) Missile". Weapon Systems Book (PDF). Program Executive Office Missiles and Space. 2012. p. 97. Archived from the original (PDF) on October 16, 2014. Retrieved September 27, 2014. ^ "MEADS Successfully Intercepts Air-Breathing Target at White Sands Missile Range". MEADS International. November 29, 2012. Archived from the original on March 4, 2017. Retrieved September 27, 2014. ^ "PAC-3 Missile Segment Enhancement". Lockheed Martin. Archived from the original on October 19, 2007. Retrieved September 27, 2014. ^ "Lockheed Martin to supply first PAC-3 MSE missiles". Shephard Media.com. April 29, 2014. Retrieved September 27, 2014. ^ "Signed, Sealed, Delivered: Lockheed Martin Delivers First Upgraded PAC-3 Missile Interceptors". PRNewswire.com. October 6, 2015. Retrieved January 5, 2018. ^ "U.S. Army Declares Lockheed Martin's PAC-3 MSE Initial Operational Capability". Army Recognition.com. August 16, 2016. Retrieved January 5, 2018. ^ Osborn, Kris (January 16, 2017). "Army Extends PATRIOT Missile Tech-Improvement in Lockheed Deal". Scout Warrior. Archived from the original on February 4, 2017. Retrieved January 5, 2018. ^ "Raytheon-Rafael Pitch 4th-Gen Patriot System". Defense News.com. August 31, 2013. Archived from the original on September 7, 2013. Retrieved September 27, 2014. ^ Trimble, Stephen (April 7, 2009). "Lockheed proposes funding plan for air-launched Patriot missile". Flight International. Archived from the original on December 26, 2010. Retrieved September 27, 2014. ^ a b "Patriot Report Summary" (PDF). Office of the Under Secretary of Defense For Acquisition. January 2005. Archived from the original (PDF) on February 26, 2006. ^ Butler, Amy (May 15, 2013). "Italy Looks To Poland As Meads Production Partner". AviationWeek.com. Retrieved September 27, 2014. ^ "US Army to Extend Patriot Missiles Service Life to 45 Years". Deagel.com. April 1, 2013. ^ "U.S., Patriot Partners to Invest up to $2.3 Billion in Patriot IAMD System". Defpost.com. February 1, 2018. Retrieved February 2, 2018. ^ "Patriot TMD Deployment". GlobalSecurity.org. June 18, 2015. Retrieved July 29, 2015. ^ "Japan Patriot Battalion fields first operational Dismounted Patriot Information Coordination Central (D-PICC)". ^ "D-PICC line item in the 2016 Exhibit P-40, Budget Line Item Justification: PB 2017 Army, February 2016" (PDF). ^ Drogin, Bob (February 22, 1991). "Rockets, Shrapnel Rain on Iraqi Targets in One of Fiercest Barrages : Assault: A new high-tech system allows U.S. tracked vehicles to launch missiles and make a fast getaway". Los Angeles Times. Retrieved January 5, 2018. ^ Lewis, George N.; Fetter, Steve; Gronlund, Lisbeth (March 1993). "Casualties and Damage from Scud Attacks in the 1991 Gulf War" (PDF). Massachusetts Institute of Technology Defense and Arms Control Studies Program. Archived from the original (PDF) on January 2, 2016. Retrieved May 11, 2010. ^ "A Review of the Suggested Exposure of UK Forces to Chemical Warfare Agents in Al Jubayl During the Gulf Conflict". Office of the Special Assistant for the Gulf War Illnesses. January 2000. Retrieved May 11, 2010. ^ "House Government Operations Committee – The Performance of the Patriot Missile in the Gulf". Federation of American Scientists. April 7, 1992. Archived from the original on January 15, 2003. Retrieved June 13, 2009. ^ Postol, Theodore; Lewis, George (September 8, 1992). "Postol/Lewis Review of Army's Study on Patriot Effectiveness". Federation of American Scientists. Archived from the original on April 2, 2015. Retrieved June 13, 2009. ^ Zimmerman, Peter D. (November 16, 1992). "A Review of the Postol and Lewis Evaluation of the White Sands Missile Range Evaluation of the Suitability of TV Video Tapes to Evaluate Patriot Performance During the Gulf War". Inside The Army. pp. 7–9. Archived from the original on December 24, 2013. Retrieved June 13, 2009 – via Federation of American Scientists. ^ Apple Jr., R. W. (February 26, 1991). "War In The Gulf: Scud Attack; Scud Missile Hits a U.S. Barracks, Killing 27". The New York Times. Retrieved June 15, 2017. ^ a b "Patriot missile defense, Software problem led to system failure at Dharhan, Saudi Arabia; GAO report IMTEC 92-26". US Government Accounting Office. February 27, 1992. Retrieved January 5, 2018. ^ Skeel, Robert (July 1992). "Roundoff Error and the Patriot Missile". SIAM News. Society for Industrial and Applied Mathematics. 25 (4): 11. Archived from the original on July 2, 2010. Retrieved May 8, 2013 – via University of Puerto Rico at Humacao. ^ Drogin, Bob; Morrison, Patt (February 26, 1991). "Iraqi Missile Slams Into GIs' Barracks; 27 Killed : Scud attack: 98 are hurt in the deadliest such strike of the war. Quarters were for Pennsylvania reserve unit". Los Angeles Times. Retrieved January 5, 2018. ^ Arnold, Douglas N. (August 23, 2000). "The Patriot Missile Failure". University of Minnesota. Retrieved January 5, 2018. ^ Stewart, Cameron (February 18, 1999). "Nurrungar played fateful role in Desert Storm tragedy". The Australian. Retrieved September 27, 2014 – via Hartford Web Publishing. ^ Bush, George H. W. (February 15, 1991). "Remarks to Raytheon Missile Systems Plant Employees in Andover, Massachusetts". George H. W. Bush Presidential Library. Retrieved September 27, 2014. ^ Postol, Theodore A. (April 7, 1992). "Optical Evidence Indicating Patriot High Miss Rates During the Gulf War". Federation of American Scientists. Archived from the original on April 15, 2009. Retrieved January 29, 2008. ^ Pedatzur, Reuven (April 7, 1992). "The Israeli Experience Operating Patriot in the Gulf War". Federation of American Scientists. Archived from the original on December 9, 2014. Retrieved June 13, 2009. ^ Zraket, Charles A. (April 7, 1992). "Testimony of Charles A. Zraket". Federation of American Scientists. Retrieved June 13, 2009. ^ Zimmerman, Peter D. (April 7, 1992). "Testimony of Peter D. Zimmerman". Federation of American Scientists. Archived from the original on May 20, 2010. Retrieved June 13, 2009. ^ "Star Wars – Operations". Federation of American Scientists. Archived from the original on December 9, 2014. Retrieved September 27, 2014. ^ The Fifth Estate. Toronto, ON. February 5, 2003. CBC. ^ Dewitte, Lieven (March 25, 2003). "U.S. F-16 fires on Patriot missile battery in friendly fire incident". F-16.net. Retrieved September 27, 2014. ^ Piller, Charles (April 21, 2003). "Vaunted Patriot Missile Has a 'Friendly Fire' Failing". Los Angeles Times. Retrieved September 27, 2014. ^ Gittler, Juliana (April 19, 2003). "Atsugi memorial service honors pilot killed in Iraq". Stars and Stripes. Retrieved September 27, 2014. ^ "Gaza drone enters Israel, is shot down over Ashdod by IAF". The Jerusalem Post. July 14, 2014. ^ "Gaza drone downed by IAF". The Jerusalem Post. July 17, 2014. ^ "Israel Air Force Hones Patriot Batteries for UAV Defense". DefenseNews.com. November 16, 2014. Archived from the original on November 22, 2014. ^ Egozi, Arie (September 23, 2014). "Israeli Patriot downs Syrian Su-24". FlightGlobal. Retrieved September 27, 2014. ^ ""Патриот" не смог сбить российский беспилотник, случайно залетевший в Израиль" ["Patriot" failed to bring down Russian drones, who accidentally flew into Israel]. Russia-24 (in Russian). August 7, 2016. Retrieved January 5, 2018. ^ "Israel sends 3 missiles to intercept intruder drone from Syria… unsuccessfully". Russia Today. July 18, 2016. Retrieved January 5, 2018. ^ Cohen, Gili (April 27, 2017). "Israel Shoots Down Syrian Drone Over Golan Heights". Haaretz. Retrieved January 5, 2018. ^ "IDF fires Patriot to intercept Hezbollah drone in Golan Heights". Ynetnews. September 19, 2017. Retrieved January 5, 2018. ^ "IDF fires Patriot missile toward UAV approaching Israel's Golan Heights". The Jerusalem post. ^ "IDF intercepts Syrian drone that penetrated 10 kilometers into Israel". The times of Israel. ^ "Israel fires Patriot missile against drone on Syrian border". The Jerusalem post. ^ "IDF shoots down Syrian fighter jet with Patriot missiles". Ynetnews. July 24, 2018. Retrieved July 24, 2018. ^ Neuman, Scott (June 6, 2015). "Saudis Shoot Down Scud Missile Fired By Houthi Rebels In Yemen". NPR.org. Retrieved January 5, 2018. ^ "Saudi military intercepts Scud missile fired by Yemeni forces". Reuters.com. August 26, 2015. Retrieved January 5, 2018. ^ "Saudi Arabia intercepts Houthi missile near Mecca". Al Jazeera. October 28, 2016. Retrieved January 5, 2018. ^ "Yemen's Houthis launch missile toward Saudi holy city, coalition says". Reuters.com. October 28, 2016. Retrieved January 5, 2018. ^ "Houthi Forces Use UAVs against Saudi Patriot Anti-Aircraft Weapon Systems". Southfront.org. March 23, 2017. Retrieved January 5, 2018. ^ CNN, Amir Vera and Nic Robertson,. "Saudi Arabia intercepts missile over capital city". CNN. Retrieved March 26, 2018. ^ Binnie, Jeremy (November 17, 2015). "UAE Patriots credited with two intercepts in Yemen". Janes.com. Archived from the original on November 13, 2016. ^ Raytheon (March 5, 2015). "Experience the Patriot Evolution". YouTube. Retrieved January 5, 2018. ^ "Israel completes upgrade of PAC missile defense". World Tribune. May 12, 2010. Archived from the original on July 27, 2014. Retrieved September 27, 2014. ^ "Air Defense: Israeli Patriot Replacement". StrategyPage.com. December 13, 2012. Retrieved January 5, 2018. ^ "Gulf States Requesting ABM-Capable Systems". Defense Industry Daily. Retrieved August 17, 2010. ^ "Air Defense: Kuwait Versus Iranian Missiles". StrategyPage.com. August 6, 2012. Retrieved September 27, 2014. ^ Cordesman, Anthony H. (2006). Arab-Israeli Military Forces in an Era of Asymmetric Wars (1st ed.). ^ Terrill, W. Andrew (2010). Global Security Watch--Jordan. ^ "Jordan To Receive 3 US Patriot Anti-missile Batteries On Feb 6 Diplomats". www.informationclearinghouse.info. ^ "La Jordanie déploie des batteries Patriot contre Damas". February 22, 2012. ^ "Momani: المومني : الأردن يمتلك صواريخ باتريوت للرد على أي خروقات" [Jordan has Patriot missiles to respond to any violations]. Alrai (in Arabic). Retrieved March 26, 2018. ^ "UAE seals deal for Patriot missiles". The National. United Arab Emirates. December 25, 2008. Retrieved September 27, 2014. ^ "36(b)(1) Arms Sales Notification". Federal Register. November 16, 2012. Retrieved January 5, 2018. ^ Binnie, Jeremy (November 27, 2018). "Qatari air defence commander says Patriot is operational". IHS Jane's 360. Doha. Archived from the original on November 27, 2018. Retrieved November 27, 2018. ^ International Institute for Strategic Studies (2010). The Military Balance. Routledge. p. 33. ISBN 978-1-85743-557-3. ^ "International Institute for Strategic Studies". iiss.org. ^ "Air Defense Artillery Unit Locations" (PDF). AirDefenseArtillery.com. 2010. Archived from the original (PDF) on September 17, 2010. ^ "Letter of Offer and Acceptance for Patriot systems' purchase signed in presence of DefMin, U.S. ambassador". Nine O'Clock. Bucharest. November 29, 2017. Retrieved November 29, 2017. ^ "US and Poland strike $10.5 billion missile defense deal". Deutsche Welle. November 18, 2017. Retrieved November 29, 2017. ^ Jen Judson, US State Department clears Poland's $10.5B request to buy Patriot, Defense News (November 17, 2017). ^ Jen Judson, Poland has sticker shock over 'unacceptable' price tag for Patriot buy, Defense News (December 6, 2017). ^ @mblaszczak (January 31, 2018). "Dobre wieści w sprawie programu Wisła. Uzyskaliśmy niższą cenę oraz przyspieszony termin dostawy. Redukcja kosztów nie ogranicza zakładanych zdolności bojowych systemu. Jesteśmy na dobrej drodze, aby podpisać umowę z końcem pierwszego kwartału 2018 roku" (Tweet) (in Polish). Archived from the original on February 5, 2018. Retrieved February 5, 2018 – via Twitter. ^ Judson, Jen (February 1, 2018). "Patriot price tag reduced, new Polish defense minister tweets". Washington, DC. Archived from the original on February 4, 2018. Retrieved February 5, 2018. ^ Kelly, Lidia. "Poland signs $4.75 billion deal for U.S. Patriot missile system..."
^ Hedberg, Henrik (November 7, 2017). "FMV inleder förhandlingar om anskaffning av Patriot luftvärnssystem" [FMV initiates negotiations for procurement of Patriot air defense system]. Försvarets materielverk (in Swedish). Retrieved January 5, 2018. ^ "Iranian Sayyad-2 missile". Mashregh News Agency (in Arabic).